The peace accords are a major issue of debate in Colombia’s presidential elections. In first round voting on May 27, 2018, the voters chose polar opposites to go into a second round: conservative Iván Duque with 39 percent of the votes and progressive politician Gustavo Petro, former mayor of Bogotá, with 25 percent of the votes. The pro-peace moderate and leftist candidates split the vote, with centrist former mayor of Medellín and governor of Antioquia Sergio Fajardo nearly matching Petro with 24 percent and former government peace negotiator Humberto de la Calle winning 2 percent. Petro received the largest vote for a leftist presidential candidate in Colombian history. While Duque’s vote was far above Petro’s, this doesn’t indicate that voters roundly reject the peace accords. 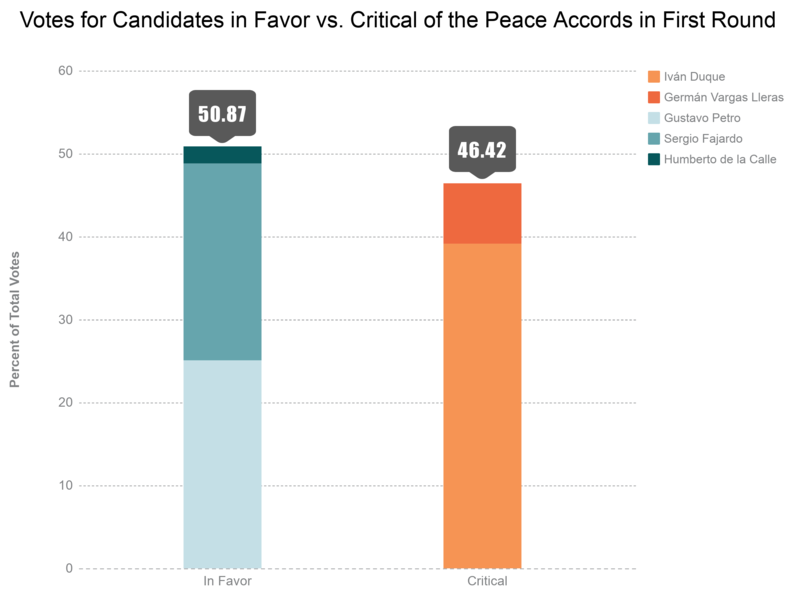 A glance at all the candidates’ votes show that more voters chose pro-peace candidates than chose candidates critical of the peace accords. Neither candidate going on to the second round has the capacity to unite the divided country behind a common agenda. Duque, candidate for the Centro Democrático, is a fierce critic of the peace accords. An adviser to the Inter-American Bank for many years, he ran successfully for senator in 2014, positioning himself as protégé to hardline former President Álvaro Uribe and an outspoken voice against the peace process. A former member of the M19 guerrillas, Petro was instrumental in the peace process leading to the M19’s demobilization in 1990. He has been involved in the political life of the country including as a member of Congress, senator and mayor of Bogotá for the last 28 years. While his critics raise the specter of Venezuela, Petro emphasizes his commitment to the 1991 Constitution of Colombia. While its promises are far from implemented fully, this constitution is a model of protection of individual rights as well as enshrining the first legal protections for the collective territorial rights of Afro-Colombian and indigenous peoples. Petro pledges to implement the peace accords with the FARC and will be likely to move ahead with negotiations with the remaining ELN guerrillas. With the left-moderate vote split and Petro’s propensity to turn off moderate voters, Duque is favored to win. But Duque will have a difficult time winning over Fajardo’s following, voters supportive of peace and tired of polarized politics. The leadership of Fajardo’s Coalición Colombia have split between supporting Petro and “votando en blanco”—supporting no candidate, or a null vote. Fajardo himself declared that he would cast a null vote. If Duque wins the second round, what happens with the peace accords is still undecided. Will he really seek to overturn the peace accords? That is difficult to do. More likely, he will simply undermine them by seeking unilateral changes in the terms of pieces of the accords and downplay them via lack of funding and implementation. He has called for increasing the penalties that were agreed to in the accord on demobilized guerrilla leadership. He will likely promote rural development that favors large landowners and extractive industries, which will make it even more difficult to implement laws and the parts of the peace accord that promise return of land and reparations and livelihoods for the millions of victims of Colombia’s devastating conflict.